The new National Law Enforcement Museum isn’t easy to find, and that’s a good thing. Tucked beneath Washington, D.C.’s Judiciary Square, the 57,000-square-foot facility, which opened in mid-October, is only visible via two glass pavilions that mark its presence on the street. 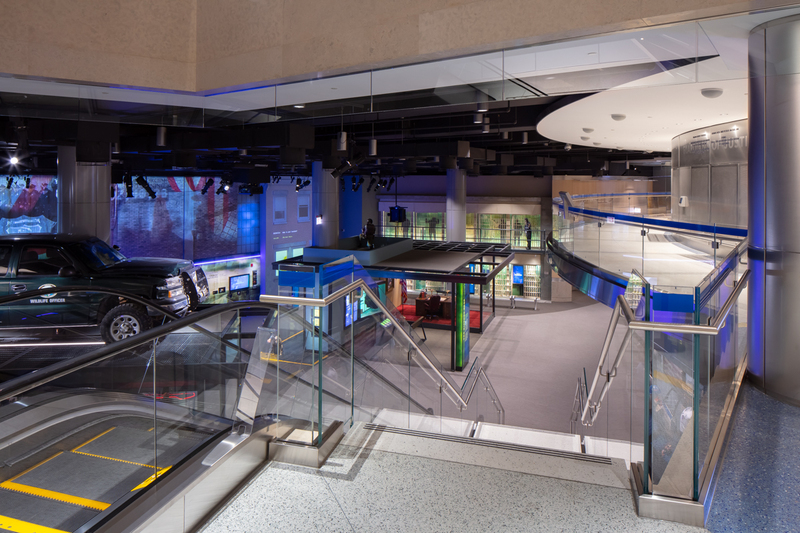 Driving, walking, or pedaling by, you’d never know that under the asphalt lies a structure that dives deep into the history of the policing profession in the United States. 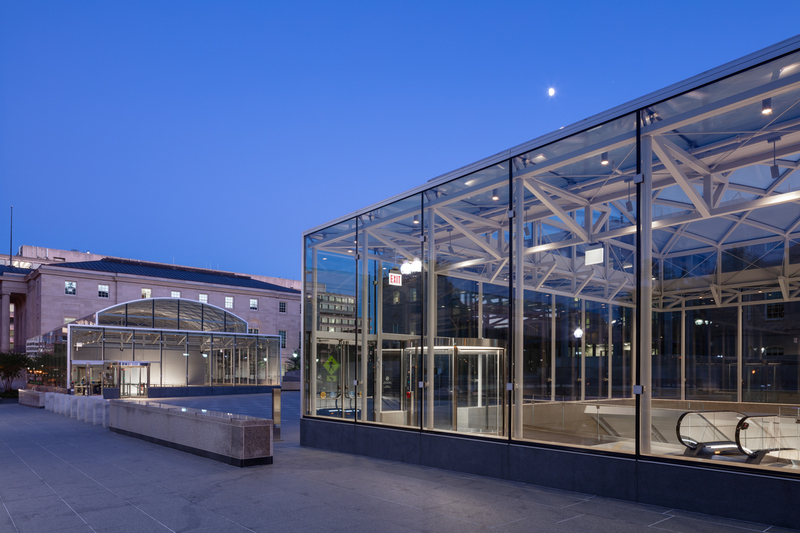 In a recent article, The Washington Post noted that the museum, designed by Davis Buckley Architects and Planners (DBA), “exhibits history with a light touch of controversy.” The architecture goes out of its way to minimize that controversy. An attention-grabbing, large-scale structure would have been a mistake given contemporary anger between local communities and law enforcement agencies. The museum goes underground in an apparent sign of humility, but also largely because of the federal building requirements already in place for that specific site. It’s located under a plaza in front of the historic District of Columbia Courthouse, a striking neoclassical building. 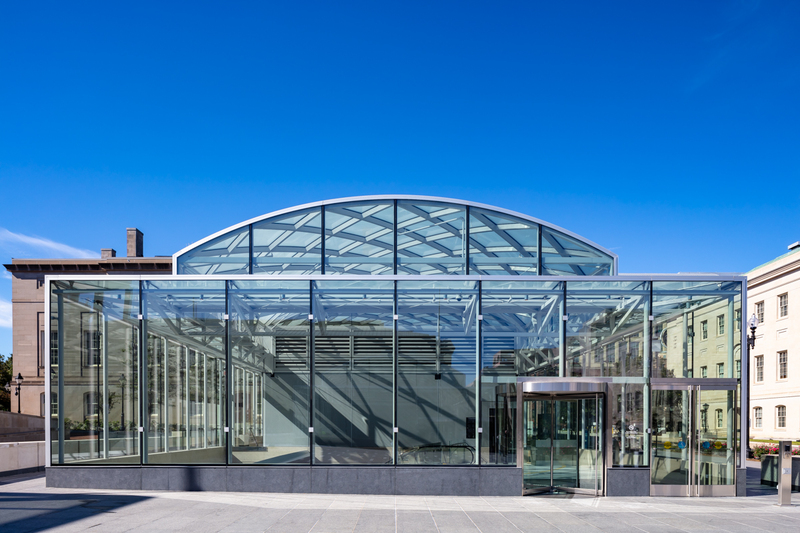 The museum’s pavilions rise 25-feet above the courthouse square, allowing the landmarked structure to retain clear sight lines of the adjacent National Law Enforcement Officers Memorial, which DBA completed in 1991. In an effort to respect this context and comply with public law, the museum was constructed below-grade, rendering it nearly invisible to the public. Despite this, the space is more rooted in light than shadow. The semi-submerged three-story building boasts ample natural light thanks to the aforementioned above-ground transparent boxes that serve as the entrance and exit. As the sole points of access to the outside world, these portals enliven what would have otherwise been a claustrophobic sunken space. The architects chose to make light a central feature of the design, which is helpful considering the sometimes somber nature of the museum’s content. DBA, a local firm, has plenty of experience with the difficult nature of designing commemorative architecture. 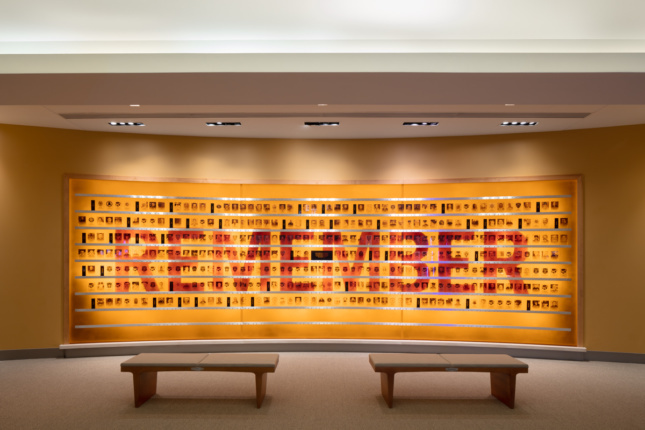 Principals Davis Buckley and Tom Striegel have created award-winning designs all over D.C., most notably the National Japanese American Memorial. Their work is thorough and thoughtful, two major reasons why the non-profit organization in charge of the memorial plaza and garden, the National Law Enforcement Officers Memorial Fund, chose them again to build out the major exhibition space. The museum is the result of a near 20-year effort. In 2000, Congress passed a bill supporting the project that President Clinton signed it into law later that year. 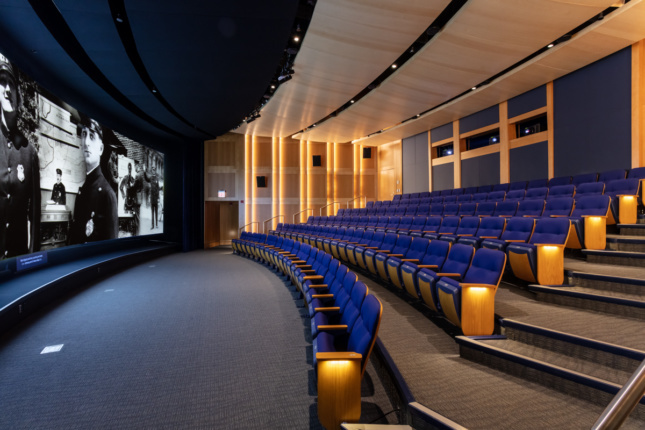 Though constructed on federal land and supported by the government, the $103 million museum was entirely funded through private donations raised by the Memorial Fund. Nearly a quarter of the money was raised through an annual police bike-riding fundraiser. This allowed the vision for the museum to be dictated solely by its supporters. Based on this timeline, the museum’s creation was not intended to be a response to this current political moment, but it’s hard to detach from the fact that it came online this year at the height of 21st-century racial tension and police brutality in the U.S. The exhibits, as well as, the building’s design, don’t explicitly confront these issues. Since the museum opened, it’s maintained a relatively low-profile for smart-but-obvious reasons. According to Rebecca Looney, lead director of exhibits and programs, it isn’t here to address current national politics but to give civilians a “walk in their shoes” experience of what it’s like to be in law enforcement. For all intents and purposes, the museum does just that. With an extensive collection of over 20,000 artifacts from historic moments in our nation’s history, such as the handcuffs used by police to arrest Robert F. Kennedy’s assassin to the bulletproof vest that Al Capone wore, anyone who is remotely interested in crime will be gripped. The curation even caters to pop culture enthusiasts with RoboCop’s full costume and clips of Brooklyn Nine-Nine. When a visitor steps into the facility, they get a sweeping view of almost the entire exhibition space simply from traversing the curved, second-floor walkway. With a sneak peek of what’s to come, people of all ages can zero in on the interactive exhibition they’d like to view first, whether it’s hearing about how cops train search-and-sniff dogs or taking a faux emergency call at a police dispatcher’s console. Many of these exhibits are laid out within a single, spacious room that makes other over-crowded local museums seem even more stifling. Several of the museum’s exhibits look at law enforcement through the lens of heroism, but none more respectfully than the small room known as the “Hall of Remembrance.” Photos of officers who have died this year in the line of duty are displayed in row after row on the room’s back wall. It’s a startling view, given the wall is nearly full with well over 300 people. The headshots will rotate each year, according to Looney, and will play a special role in National Police Week every May when officers and their families visit for the first time. Other media exhibits show how law enforcement responded to and worked with communities after September 11, 2001, and the Emanuel 9 massacre, among other recent tragedies. 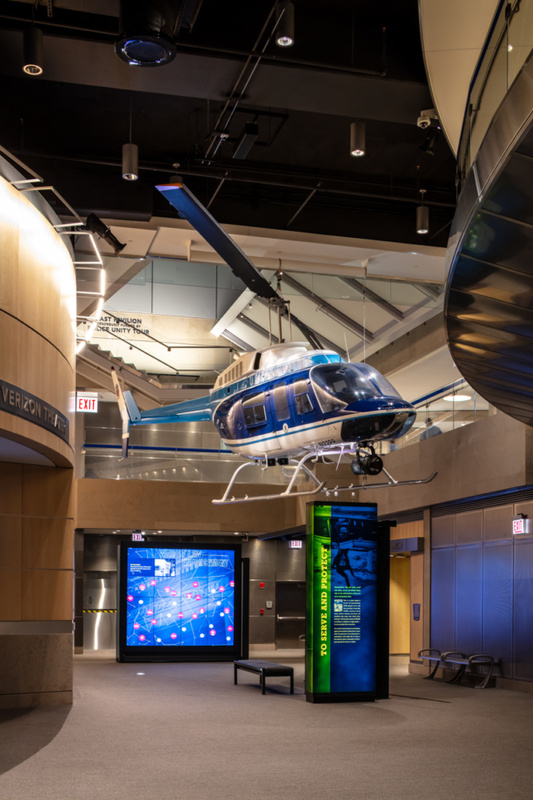 One of the museum’s main offerings is a 20-minute introductory video that details the history of law enforcement and current issues officers face every day in police work. It’s set inside a striking, 111-seat theater with dramatic acoustics. According to Looney, weighty topics like police brutality and corruption within the profession won’t be explored in the museum’s main exhibits but will be part of educational programming and temporary shows when possible. Critics are already calling this a major flaw and a missed opportunity. The National Law Enforcement Museum’s completion comes on the heels of the David Adjaye–designed Smithsonian National Museum of African American History and Culture (NMAAHC), which opened in September of 2016. The two museums are starkly different. While the NMAAHC gives much more space to the Black Lives Matter movement and the relationship between the African American community and the police, the law enforcement museum only dips briefly into those issues, touching on the 2014 shooting and subsequent riots in Ferguson, Missouri. Maybe this will change, maybe it won’t. Regardless, the NMAAHC rightfully stands tall in all the glory that its 100-plus years of planning should produce. 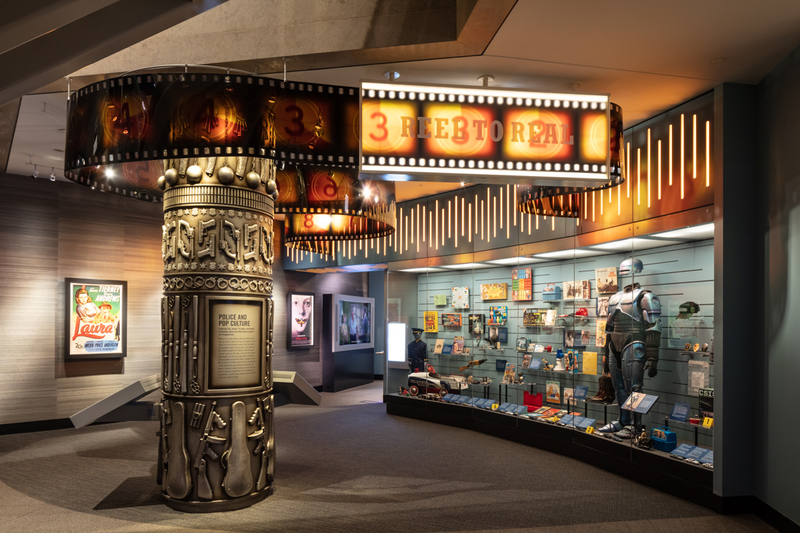 The Davis Buckley–designed museum for law enforcement—while hidden—is full of light, exuding a subtle poise, and perhaps providing a much-needed point of connection for the American people who are having trouble relating to or caring for law enforcement today. Only time will tell if it makes an impact on our cultural divide. At the very least, the museum will be a place of solace for friends and family who have lost loved ones in this profession, and for those who serve today. The National Law Enforcement Museum is located at 444 E St. NW in Washington, D.C. It’s open Sunday through Saturday from 10 a.m. to 6 p.m. and until 9 p.m. on Thursdays. Buy tickets here. Memorial Museum police Washington, D.C.